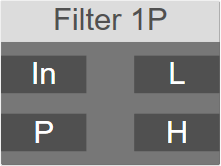 1 pole non-resonant lowpass filter. Smoothly filters out the signals above the cutoff frequency with. The cutoff frequency is calculated on a logarithmic pitch scale received on the 'P' input. P: Cutoff frequency in logarithmic pitch.